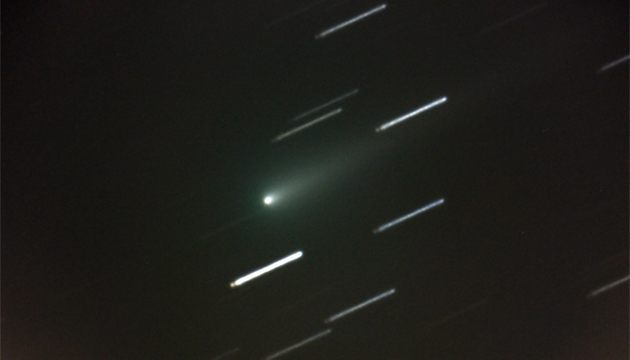 Comet ISON: Celestial Popcorn That's Ready to Pop? Comet ISON has entered the inner solar system! On about October 1st, the comet that has attracted so much attention and prompted many projections, prognostications and probably a few wagers, crossed the orbit of the planet Mars to begin its final sprint to the center of the solar system. It's the last and fastest dog-leg of its long journey from the cold dark reaches of outer space to its potentially fateful close encounter with the Sun. Discovered in September 2012 by Vitali Nevski and Artyom Novichonok with a telescope of the International Sky Observer Network, Comet ISON has since been tracked by telescopes around the world—including the one that actually goes around the world: the Hubble Space Telescope. It has even been scoped out by cameras on NASA's Mars Reconnaissance Orbiter when it sailed close to Mars a couple of weeks ago. All of this scrutiny is aimed at learning as much about the physical nature of this ancient time capsule as possible before it reaches a crucial point in its flight through the solar system: perihelion, the point where it passes closest to the sun, on November 28. Crucial, because at that time it will be less than a single solar diameter from the Sun's surface, and exposed to intense radiation that could vaporize it and gravitational tidal forces that will work to tear it apart. What have all of these observations told us about the betting odds of the comet's survival, or whether we'll be able to see with our eyes? Last April, the Hubble Space Telescope determined that ISON's rotation is slow—so slow that, so far, only one side of it has been exposed to sunlight. Day by day, as the comet draws closer to the sun, the heating of its sunward size grows stronger. Its surface ices are transformed into gases that envelop the icy nucleus in a vast shroud called a coma. When a comet gets close to the sun, its coma is blown away from the nucleus by sunlight into the familiar shape of the comet's tail. Key to how bright and fluffy (or flat and ho-hum) a comet becomes is how big a coma it develops, how much ice is converted into gas, and how quickly. The fact that this comet has shown only one face to the sun is intriguing. It means that it has a dark side, cold and protected, yet to feel the touch of solar rays. Sheltered on the shady side of ISON is likely to be a load of frozen but highly volatile ices. While the sunlit side of ISON has been warming and leaking away materials for at least a year now, the dark side remains pristine, a reservoir of untapped volatile material that awaits release. Maybe a week before perihelion, the dark side of ISON is expected to begin turning into the sunlight. The sudden exposure to the intense radiation could cause a strong outburst of gases into the coma--like a celestial popcorn kernel suddenly bursting. Another observation critical to predicting of the fate of ISON is its size. How big a comet is becomes an important factor when its orbital path is to carry it so scorching-close to the sun. As ISON has fallen closer, more and better data has been collected by telescopes, starting with the Hubble's observations in April, continued by Mars Reconnaissance Orbiter earlier this month and ongoing by many telescopes around the world. From these observations ISON is estimated to be between 1 and 4 kilometers (0.6 to 2.5 miles) in diameter, roughly the size of Mount Diablo at the upper end—large enough, it is expected, to survive its close encounter with the sun on Thanksgiving. Will it blossom or sputter? Will the popcorn kernel be a dud, or will it blow the lid off the pot? There has been speculation in both directions, based on observational evidence and past experiences with the fickle and often temperamental nature of comes. The truth is, we won't know until we know, likely in the week or so following the end of November, but my hopes—and my money—are on a good show in December.